Value or Growth Funds: In Which Type of Mutual Fund You Should Invest in 2018? Read this blog to find out which investment style – Growth or Value can be the most beneficial in this market correction. Many a time, investors have an urge to put up a question - how can I select the best performing mutual funds for investment without considering the past performance when it is the only data I have? Undoubtedly, past performance is one of the crucial factors in deciding the aptness of a mutual fund for making investment, but as a smart investor, you should also reckon other factors including fund manager’s investment style, volatility, and performance in market falls. Though these factors may not guarantee the best performance (on a relative basis) in the future, analyzing all of them may let you expect better performance of your fund. Among all the factors that are being talked about, we are going to learn about the investment style of the fund manager. The fund manager’s investment style critically affects various performance parameters of a fund such as volatility, returns, alpha, beta, etc. Moving forward, we will discuss about two different investment styles- Growth Investing and Value Investing. We will also find out, what can be the best options to invest in based on the funds’ performances of both the styles? First of all, for the benefit of our readers, we would like to throw some light on the two styles of equity investing viz. Growth and Value. Growth Investing : It is a style of investment where the fund managers focus on mid-cap companies where they expect higher than average revenue and earnings (EPS) growth in the long-term horizon. According to the market sentiments, the funds also target emerging and small-cap companies having forward and appreciable historic Earnings-Per-Share (EPS) growth rates over the short and long-term. Since the EPS of growth stocks tends to grow faster than the benchmark, they are rewarded with higher prices by the market. Value Investing : An investment style where the fund managers try to identify businesses trading at share prices which are significantly below their fair price and tend to earn when their prices go up with the increase in valuation. In a nutshell, value investors believe in gaining from the growth of fundamentally undervalued stocks which have the potential for appreciation in the future. Value investors focus on the stocks having lower than average Price-to-Book (P/B ratio) or Price-to-Earnings (P/E ratio) or higher than average dividend yields. Who Has Performed Better – Growth or Value? In order to decide which of the two types of funds have been consistent in the different market cycles based on their investment patterns, we have analyzed the returns of MSCI (Morgan Stanley Capital International Index) Growth vs. Value index over a long period of time. The data above shows the scenario of both up and down cycles of the market, and it can be seen that during the great bull of 2005 to 2009, the value index has outperformed the growth index. Saturation in the market and over-valuation of stocks shift the interest of the investors towards the value funds that place them ahead even during the period of economic recovery. On the other hand, at the time of market crash in 2008, growth funds suffered the most. 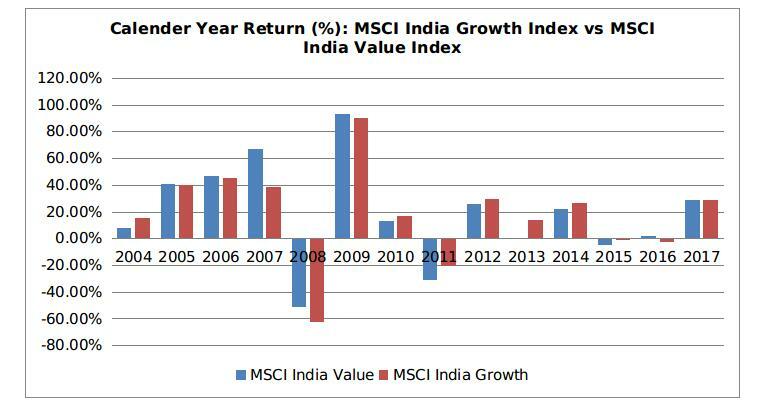 However, post 2009, growth index took the pace and left the value index behind. This happened because as the market reached the bottom in 2008, investors expected to gain from the potential growth-oriented mid-cap companies and started targeting the growth stocks. As a whole, in the last 14-year time-frame, value index has outperformed most of the times. Value funds are well-known for providing high dividend yields and maintaining the legacy by proffering 1.88% of dividend yield which was approximately double than that of the growth funds. Apparently, the P/E and P/B ratios of growth funds were much higher than the value funds. This shows that the investors have reflected the high expectations of superior growth from the growth funds. From the above data, we can conclude that the value funds tend to perform better when valuations become a concern (as seen from 2005 to 2008). On the other hand, the growth funds are rewarded when earnings growth gains pace (as seen from 2013 to 2017). After a broad comparison between the value and growth investment style, let us now take some of the top recommended mutual funds from both the categories and try to find out how trustworthy the above general results are. As per the recent data, L&T India Value Fund had outperformed its benchmark by generating over 75% returns in the year 2014 when the market started gaining its confidence after short disruptions. On the other hand, Franklin India High Growth Companies Fund had an exposure to the growth-striving businesses which observed a dip during the market downturn of the year 2013. It took time to recover from the phase and then generated over 37% of return when the market was bullish in 2017. Both the aggressive funds on our list have not been so aggressive over the period of 3 years in terms of returns. ABSL Pure Value Fund follows active portfolio management while focusing on the inclusion of value stocks which helped it to outperform its benchmark by generating 56% annual return last year. In contrast, highly growth-oriented DSP BlackRock Midcap Mutual Fund was unable to perform even during the bull runs of 2015 and 2017. The reason was stock selection from the cyclical and sensitive sectors which increased the possibility of deviation in fund’s performance with minor fluctuations in the market. Only the Earnings-per-Share (EPS) growth and not price appreciation of stock makes it growth-oriented. Chasing price appreciation with momentum can let you suffer badly in a market correction. Similarly, any stock with low P/E ratio is not value-oriented. Investing on the basis of low P/E ratio can lead to the risk of getting caught in a value trap as the P/E ratio can remain low for a very long time. While investing in equity mutual funds, the investors should have only one motive i.e., capital appreciation over a long-term horizon. However, your investment decision must be based on your risk appetite. Over a long investment horizon, both the growth and value funds can yield substantial returns, but downside risk is somewhat limited in value funds. Also, due to their lower standard deviation and beta, the value funds can be a good option during the negative market cycles (the one which is prevailing now) and for the conservative or first-time investors. The first-time investors may not have adequate knowledge of investment style of the mutual funds. At MySIPonline, we often interview fund managers to help the investors gather a sense of their investment strategies. So, if you still have any confusion regarding which investment strategy to follow, call our experts now.